Sorry, got in late last night so couldn't update the blog. 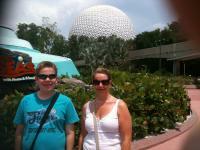 yesterday we went to Epcot, and had a very long but very good day. Test track was as good as always, but we got stuck 1/2 way through due to technical difficulties, but they've happened 3 times so far! Soaring was good, like before, we were on the middle row, not as realistic as the top! We had a wander round each world showcase, and we went on Maelstrom in Norway and Donald Duck ride inMexico, both very good. We also went on Ellen's Energy Ride, not fantastic but ok. Had some noodles in China, and tried a pretzel, very nice in warm cheese sauce. Enjoying the holiday so far, let's hope it stays that way! !